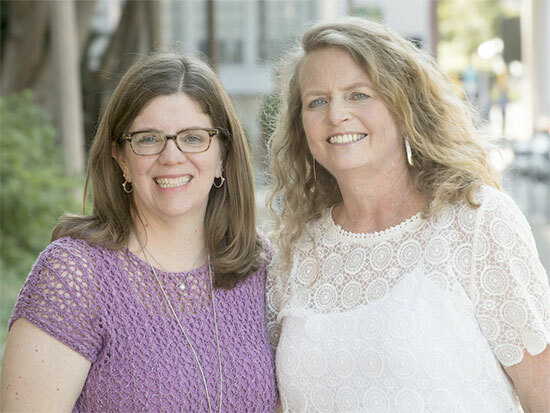 Ann Rayburn, left, and Margaret TreslerMargaret Tresler and Ann Rayburn have been friends for years, brought together at first by a meeting in the surgical intensive care unit and then by their common passion for organ donation. Tresler, a statistician in the University of Alabama at Birmingham’s James and John Kirklin Institute for Research in Surgical Outcomes, is a four-time kidney transplant recipient, most recently in 1998. Rayburn, director of Education and Referral Services for the Alabama Organ Center, has dedicated her life to promoting organ, eye and tissue donation, and she became a living kidney donor in June 2016. In fact, it was Rayburn’s decision to donate a kidney to another friend, Tess Bourge, that fueled a movement for change from Tresler and Robert Gaston, M.D., the Robert G. Luke Endowed Chair in Transplant Nephrology. When Tresler learned Rayburn needed to use her personal vacation or sick days to donate, she wanted to lobby the university to provide paid leave as an additional incentive to those who wished to donate an organ or bone marrow. UAB’s Benefits Committee, at the suggestion of Tresler and Gaston, extended university employee benefits to include four weeks of paid leave for those who want to be living donors for solid organ transplants, and one week of paid leave for bone-marrow transplant donors, a policy that went into effect March 1, 2017. But Tresler and Gaston did not stop at UAB, pushing for the state of Alabama to adopt a similar policy for all state employees, an idea that is now a reality. Alabama’s State Personnel Department has adopted a policy enabling a permanent employee with at least one year of state service to be granted Living Donor Leave with pay for donating an organ or bone marrow. The new policy went into effect Oct. 1. Tresler, Rayburn and Gaston are excited about the decision of the State Personnel Department, knowing that it will help save lives of those in need. Gaston has been involved on a national level with efforts to remove disincentives for living donors. He worked with Martha Tankersley, UAB’s transplant administrator, to get the paid-leave policy pushed through at UAB, and with Porter Banister, the senior director of Government Relations for the University of Alabama System, to help push the idea at the state level. Under the new state provision, a permanent employee with at least one year of state service may be granted living donor leave, with pay, for donating an organ or bone marrow. The employee must submit in writing a request for living donor leave, supported by verification by the physician performing the medical procedure and a recommendation by the appointing authority. Based on the certification of the attending physician, the employer may receive up to 30 days to donate an organ and up to seven days to donate bone marrow. The employee does not have to exhaust his or her leave accruals for these procedures. “We are very happy this will be a reality for all state employees, and we are hopeful that other Alabama companies will adopt a similar provision so those who have the ability and desire can be an organ or bone marrow donor without loss of income or benefits,” said Jackie Graham, director of the State of Alabama Personnel Department. More than 2,500 Alabamians are on the waiting list to receive an organ donation, according to the United Network for Organ Sharing, one of the largest state lists per capita in the United States. UAB is the third-largest transplant center in the United States, and its surgeons from the School of Medicine’s Department of Surgery have performed more than 14,000 organ transplants since 1968. UAB’s transplant services have performed more kidney transplants than any center in the nation since 1987, and UAB has the world’s longest ongoing kidney transplant chain — the UAB Kidney Chain — which has seen 74 people receive a transplant so far, all from living donors. Rayburn remembers quite well the first time she met Tresler. The year was 1998, and Tresler was the star of UAB’s Surgical Intensive Care Unit. Tresler had just received her fourth kidney transplant, on Jan. 5, 1998, this one from her brother, John. When Tresler learned Rayburn was going to be a living donor last year, she was not surprised by her friend’s decision. But as Rayburn progressed through the evaluation process, Tresler was reminded about the selflessness of her brother’s act from 18 years earlier. “I guess after all of this time, the reality of what we really went through during that time had dimmed,” Tresler said. “John had given me his kidney under life and death circumstances for me. He returned from an overseas temporary duty assignment in the Air Force in under 24 hours for his evaluation to begin. With Ann’s donating to Tess, all the factors that a living donor considers really became clear again. To do this, Rayburn suggested that Tresler meet with Gaston, who agreed to pursue the idea of paid donor leave — for both UAB and state employees — at their first meeting. Rayburn, whom both the Alabama Organ Center and UAB will sponsor to walk in the Jan. 1, 2018, Rose Bowl Parade representing living donors, says both Gaston and Tresler deserve to be commended for championing an additional way to remove barriers to organ donation. If you are interested in becoming a living organ donor, call 205-934-9999 or toll free at 800-822-8816 to request an appointment. You can also request an appointment online. A Living Kidney Donor Screening Form also is available to fill out online. To become a bone marrow donor, join the Be The Match Registry now by visiting its website. Learn more about UAB’s Blood and Bone Marrow Transplantation and Cellular Therapy Program by visiting its website. To ensure that you will be an organ donor upon death, register online with the Alabama Organ Center now here.